The Moon is in Capricorn squaring that sign's ruling planet, Saturn. Serious business and ambition is the result! Take decisions and actions seriously and recognize consequences and implications. With Saturn involved we can't be too lax about what we say and do. It's very important to treat others fairly. A mature attitude is called for. Saturn is the planet of our elders, and they may criticize or possibly give good advice today. Capricorn and Aries, deal with career challenges and the image you present in public. Libra, home related matters and relationships should be dealt with in a productive way without too much drama. Cancer, you may get the effects of all of this indirectly and your mood and actions may be impacted by external factors, people, and circumstances. Work hard, get things accomplished, and be ready to meet high standards today. Tonight is best for work and study. Scorpio and Leo may work late especially on trouble shooting and paper work type things. Wear gray. The Moon meets Mercury in Capricorn for trouble shooting, meetings, and planning during the first half of the day. Uranus throws in a surprise or two but adds a creative, out of the box influence that could help solve problems. Do business and put agreements and other things in writing before 2:31 pm when the Moon moves void of course until 6:21 pm EST. The afternoon hours are best for routine work, catching up and relaxation as well as physical workouts. The Capricorn Moon can be heavy handed so some stress release is not a bad idea this afternoon. The Moon moves to Aquarius for a more global outlook and a friendlier attitude tonight. The Moon in harmony with Jupiter gives the feeling we can achieve anything. Set sights high tonight and dream big dreams! It's a good time for rethinking before tomorrow's New Moon. Aquarius, you especially may want to chart a new course. Wear blue. The New Moon in Aquarius urges us to put plans into action. It's like taking a blueprint and beginning to build as the Moon starts a new cycle at 9:31 pm near action starting Mars, also in Aquarius. Today getting things in order, finalizing deals or plans, and creating the framework for our next moves is a good idea. Mercury and Venus actively engage other planets today too, so communication needs to be clear and relationships will be taken into consideration along with everything else going on. Sagittarius, you may find that relationship impacts all other decisions you have to make at this time. Proceed logically and methodically. Brainstorms are worth pursuing and flashes of inspiration are likely! Capricorn and Pisces, you may experience or benefit from that aspect! Gemini, don't shoot down a good idea before you've thought it out. The New Moon tonight is active with Mars and instigates as well as forces change where things have been stuck or unyielding. Use Aquarius vision today and think a bit beyond the present. Tonight is full of energy! Wear turquoise. It's a very Aquarian day as the Moon is joined by Mercury, changing signs at 5:19 pm EST. The Aquarius Moon in harmony with Saturn encourages wise advice, steady change, and well thought out decisions. This is a time of balanced changes. Act on things that have been a long time coming. Leo, relationships and partnerships and commitment in general is part of the picture. Decide what you want out of a relationship. Aquarius, you are favored for anything new and inspiring! Sagittarius and Gemini, communicate in new ways, try other methods, write, study and travel. This winter can be about opening your mind and your options. Scorpio, this is a good time to improve your living situation by moving, repairing relationships at home, or even redecorating and making your place more functional or comfortable. Mercury in Aquarius for the next few weeks highlights scientific thinking and research and, also, meeting new people including potential collaborators. Virgo, you may have luck finding or gaining a new work partner now. Wear yellow. The Moon moves to Pisces at 5:24 am and Venus enters Capricorn today. Venus in Capricorn is less adventurous in love and relationship and is very much about taking care of the practical sides of our love and business partnerships. Capricorn, this also helps you attract what you want and need. The Pisces Moon brings out vulnerabilities. Being helpful and seeing where you can pitch in or make someone feel a little bit better or more comfortable is a good idea today. The Sun and Mars meet in Aquarius, the sign of friendship, and working together is in the forecast. This dynamic meeting favors Aquarius, Leo and Aries, ruled by Mars. Tonight contains a bit of everything and personalities will contrast, from sympathetic friend to party animal to wanting to settle down into the most comfortable situation. When the Moon is in Pisces we tend to react to circumstances and feel deeply. Wear green. Next weekend at Gisland Farm in Falmouth, Maine, I will be joining others in a two day workshop called Apocalypse Not! 2012 A Shamanic Approach. In my own words, this is a program designed to prepare us for the transitions coming at the end of the Mayan calendar and to help us become co-creators who will help transform the world in a positive, healing way. Our ancient ancestors knew that we live in a holographic Multiverse that is filled with endless, remarkable possibilities, and that Time is dynamic, fluid and composed of many parallel streams. The ancestors also knew about a hidden and misunderstood, “inner technology” that allows us to choose the reality we want to follow. Their prophesies foretold a time when some of us would choose to awaken our capabilities as co-creators and use our abilities to shift time streams to a positive future for ourselves and humanity. That time is NOW! through learning how to use this amazing “inner technology.” With 2012 as a reminder to spur us forward, a very small number of people using this marvelous wisdom can change the world for the better. Using references that range from ancient stories to cutting-edge quantum physics--you will learn the hands-on steps to becoming one of the prophesied, co-creators we’ve been waiting for! Prerequisite: Working knowledge of the Shamanic Journey Process. 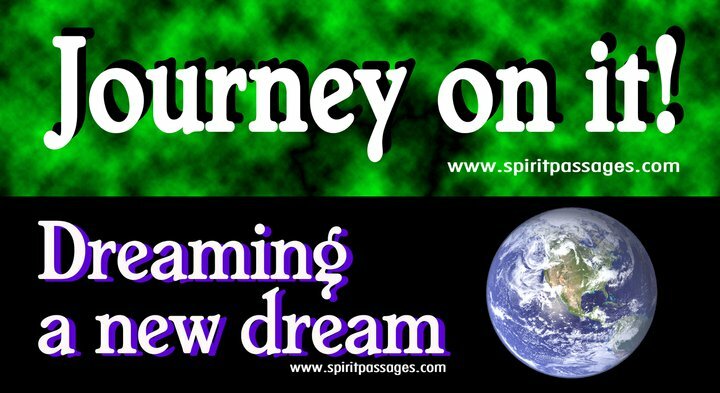 If you've never journeyed before, contact Spirit Passages for more information on introductions to Shamanic Journeying which are offered frequently. That is how I began about nine years ago, and since then I've done several personal sessions as well as workshops through Spirit Passages. If you feel like this might be for you, I would encourage you to find out more and give it a try! Next weekend there's a 2 day Shamanic Workshop at Gisland Farm in Falmouth. 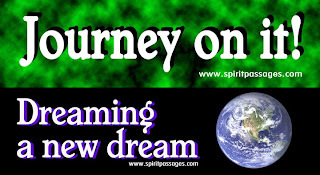 See www.spiritpassages.com for information on this, other workshops and the 2 Year Training Program starting soon. The Libra Moon is square to both Pluto and Mercury indicating organizational and communication issues today. Be prepared to compromise and change times, appointments and dates. Meeting each other half way will be important and help alleviate frustration. A me-first or self centered attitude will aggravate things. The Libra Moon is in harmony with Mars in Sagittarius sparking chemistry and conversations about philosophies of life and big ideas. Leo, Libra and Sagittarius will enjoy this kind of exchange so get them involved in your talks or meetings. Tonight the Moon meets Saturn in Libra which can be rough on relationships and other collaborations if realities set in or expectations are different on either side. It might be hard to find compromise tonight. Try to keep conversations logical rather than emotional and that goes for emails and other communications too. It's a good night to put the mind to work on studies or anything that requires logic. Wear light blue. The Moon in Libra is in harmony with Venus and Neptune for a much needed, easygoing day. We might wear rose colored glasses but at least moods should get a boost! Venus and Neptune both relate to romance, as well as friendship, so enjoy the people around you. This is a good day to make a date, for tonight or for the future. Sagittarius, you host the planet Venus now so make the most of the attraction and good feelings this planet bestows! Leo, Venus in Sagittarius is great for you in romantic relationships and also gives you a lucky edge! Aquarius it's a great time for forming friendships which also may lead to romance. Meet a friend of a friend or let a friendship develop into something more. Today is mostly about people and our connections with each other. If you're doing business, mix in a business lunch. Have a light approach, collaborate and be friendly. The Moon is void of course from 5:04 pm to 9:15 and then slinks into Scorpio for a bit of mystery and intrigue tonight. See a suspense film or explore questions that are hard to answer tonight. Wear pink. Mercury squares Jupiter newly in Aries, and the Moon squares the Sun and Mars setting up a very stubborn and potentially confrontational day. Without challenges like this we would never make changes however, and in the long run muddling through and dealing with things is necessary. The Moon, Sun and planets are forcing some issues or boundaries today. Mercury and Jupiter affect communication and plans. Work harder to get your point across. Louder or more forceful may not be the best method though since Mars can trigger anger. Build your story with intelligence, logic and a powerful, assertive attitude but not aggression. If people seem to need space or privacy, respect that. Scorpio Moon time is not the time to push. Tonight is more of the same. If you need to, retreat or disappear for a while. Wear maroon today. The Moon is in Scorpio and though today may have a stubborn streak, the Moon and Mercury ease conversations and negotiations. Approach each other with sensitivity, but don't shy away. Leo and Libra may be working through issues at home, while Scorpio could have important contracts or other business matters on the line. Creative differences are in the forecast today, but really good things could come from working through it and collaborating. Tonight the Moon and Uranus align for a bigger burst of creativity as the Moon moves void of course at 10:01 pm EST. Late night hours are very unpredictable. Be aware and watch your back and your belongings. Today's color is indigo blue. The Moon moves into Sagittarius at 1:55 am and is in harmony with the Sun, Jupiter and Mars for a very optimistic and adventurous Friday. Get out of usual routines, take a road trip or go on vacation, explore new ideas and be out there in the world experiencing and enjoying life. Take advantage of a really positive day. if there's a downside it's for those who want things to stay the same and are obsessing about people or problems. The Sagittarius Moon won't stand for restrictions. Wear purple. The Moon works with Saturn in Libra and meets Venus today. This puts all relationships and partnerships in the forefront. Venus in Sagittarius wants excitement and love all rolled up in one. Old problems and stagnant love lives have no place in today! Even serious Saturn encourages working things out more reasonably at minimum. New love and relationship adventures and events are especially favored for Leo, Sagittarius, followed by Gemini and Aquarius. Get out and have fun, meet people, and keep an open mind. Sparks fly in love lives today! Sagittarius also values freedom and some couples may call it quits knowing that it will just never work. Wear red. The Moon moves to Capricorn at 9:04 am for a get it done attitude today. The Moon meets Pluto tonight which can mean harsh realities if you avoided something all weekend. Squares between the Moon and planets, like Jupiter in Aries for example, mean we have to work hard for progress. Aim to be productive and not duck responsibilities. Having to answer to authority figures is likely today, or if you are the authority you may be pushing for answers or setting deadlines. Go through your to-do list even if it's slow going. Also, work on resetting priorities. Wear black. Quick Full Moon in Cancer rundown. Recall we had an eclipse during the December 21st Full Moon followed by a solar eclipse with January 4th's New Moon, therefore this week vibrates with eclipse type news and action again. In Cancer, this home sign Full Moon brings peaks in home and family matters and is supremely emotional. With the Capricorn influence also strong, changes and news about administrations, organizations, and business also develops. The two signs mentioned are in the throes of personal and relationship changes, doubts or questions, and those of us with Cancer/Capricorn rising signs experience the same. One significant and very positive influences comes from benevolent Jupiter in Pisces in harmony with Moon and Sun in those opposing signs. The Jupiter influence will be the focal point of key points for each sign in the notes ahead. Cancer: Personal changes and realizations that crystalize now have the added effect of Jupiter in your 9th house indicating opportunities will be knocking. The 9th house relates to global travel, higher learning, and spiritual or philosophical beliefs. You may decide to break down structures that have held you in one place. It's a mind opening time where engaging in travel and study opportunities can change your perspective. Even if you're not making changes, questioning your purpose and path sets you up for what's next. Leo: Jupiter's presence in Pisces for just a few more days is financially positive, and partnership opportunities are present with this Full Moon. Find funding or investors and receive needed support. That may come in the form of a space for your business, a lender who grants your request, or a settlement you've been waiting for. This Full Moon is also prime for healthy changes, both mental and physical. Virgo: This Full Moon is very much about Virgo relationships, and Jupiter in your opposite sign, Pisces, helps resolve or forward matters of love. Even divorcing now will be easier if that's the situation you're in this year. New friends are relationships are sparked too and the Wheel of Fortune seems to spin in your favor. Libra: Home and career, including a tug or decisions that affect both are in your forecast. The Jupiter effect in your chart helps with practical aspects, making it easier to see what's most rational and beneficial. A Cancer Full Moon puts you very much on display. It's time to be recognized for both your talents and for jobs well done. Scorpio: Cancer Full Moon is potent with opportunity and excitement. Experiences now involve learning too though, and your mind must be open! Jupiter in Pisces, in beautiful harmony with the Sun and Moon, is lucky for you. Friends or romantic partners are likely to be involved or included in your success. This Full Moon should be a time for celebration as well as open new doors and new ways of thinking. Sagittarius: Jupiter in Pisces puts blessings on your home and family during Full Moon time. The Cancer/Capricorn energy this winter may raise concerns about money and earthly things, but this Full Moon is protective and reassuring. New solutions or sources of money come to light. Capricorn: Relationships and personal concerns are a big factor in a winter that may be life changing for you more than most people you know. Jupiter in Pisces makes it a favorable time for contracts, agreements, promises, commitments and communication. Trust your instinct and make your moves. Aquarius: The Cancer Full Moon finds you ready for a change in routine, and some old ways of doing things may be shed. Finding yourself on new and different ground can be strange, but Jupiter in Pisces helps put supports in place. Having the resources to make changes helps a great deal! Money and employment opportunities may seem to come from out of the blue. Being productive will feel good but balancing that with rest and introspection will be important too. Expect interesting, insightful dreams. Pisces: Jupiter is acting from your sign with all the best Pisces traits like creativity and compassion for others. Romance is also part of the picture during this Cancer Full Moon. Make romantic and friendly connections and enjoy social events. It's likely that at least one new friend becomes important in your life. Aries: Cancer Full Moon brings things to a head or to decision making time in your home or family life. A move or improvement at home now should turn out very well! Some Aries will find the home of their dreams while others make significant improvements in their living circumstances. Moving and career may be intertwined. Jupiter in Pisces eases your mind about decisions that have long term impact. Taurus: Communication, travel and marketing are the keys to this Full Moon. Jupiter in Pisces lends good fortune and it's likely you already know what you need to do. Finally the circumstances seem right. Trust that things have fallen into place, communicate clearly, get advice with contracts, legalities or rights (publishing or copy rights for example), and make the move you've been intending. For some Tauruses this may mean back to school and an intense course of study ahead. Gemini: Cancer Full Moon highlights money and employment and the earthly things that create security for you Gemini. Your financial situation has been favored for a few weeks this winter. A decision you make now could change your economic status significantly. Jupiter in Pisces indicates this is more than a job or a bonus, a career move can be made! Partners are likely to be involved. Choose them wisely with an emphasis on the practical over emotional ties. This could be your lucky day/week. Don't Worry! Your Zodiac Sign Did Not Change! Simple explanation. We follow western astrology which is based on the Equinoxes. The beginning of the astrological year is at the spring Equinox. We're still the same sign! There are many more constellations than the 12 in the zodiac, and it's the planetary rulers of each sign that represent our sign's personality traits. (which is why that 13th sign they spoke of with no planetary ruler could not be a 13th sign.) I hope you're relieved. Happy Full Moon week! It's a split day as the Moon in sign of duality Gemini gets us started. The Gemini Moon aligns with Neptune early which is optimistic and friendly but can also be deceiving. Look past the surface whether that's with people or the reality of situations. The Moon goes on to square two planets in Pisces, and changes may be a struggle but worth it in the end. In true Gemini style it may feel like too much is going on this morning, especially when weighing out the pros and cons of decisions and in our interactions with others. Try not to judge too quickly. The Moon is void of course from 12:57 to 2:29 pm, and then moves on to Cancer. Cancer and Gemini couldn't be much more different. The whole tone of the day shifts. Our concerns will be personal and our emotions may be vulnerable. Being home, stable, protected, and comforted will be most appealing. The Sun in Capricorn works well with Uranus and inspires ideas and plans! Solve problems and organize in creative, new ways. Tonight is well spent rearranging and creating more comfort or organizing at home (or work space). If you're socializing, be with friends you feel safe and comfortable with, the ones who would protect or take care of you if need be. The Moon is warming up to Full and we'll be a bit sensitive in general. Wear blue. We are getting deeper into the Full Moon zone, and developments and news are forecast for the rest of the week. Some of this began at eclipse times over the past month so think back to the Solstice and the first week of this month and you may see the connection. This is a mixed and interesting Cancer Moon day with two Moon oppositions in the signs of the last two eclipses. Cancer and Capricorn, you host the action and are very personally involved. Relationships, the structure or organizations like businesses and corporations, and also home related matters are ruled by these signs. That covers almost everything! The two signs mentioned may be in the throes of relationship changes. Gemini and Sagittarius your employment and financial life are impacted. Don't be surprised if there's a new boss, a corporate shift, or buyouts and things like that during this Full Moon. Then we also have Mercury meeting Pluto in Capricorn, again pushing us to communicate better, more realistically, and to aim for honesty even about difficult subjects. Pluto dredges up the hidden. It could be a good day to solve an ongoing mystery. Tonight the Moon squares Saturn and in family and love relationships, justice is called for. Saturn in Libra expects no less and some of us will have to fess up even if we'd rather not. Do the "right" thing by people tonight, on the even of the Full Moon. Expect plenty to be stirred up and in the works. Wear white. The Moon is Full in Cancer at 4:21 pm EST. Though Full Moons can be emotional, chaotic, and exaggerate symptoms and circumstances, this Full Moon gets the benefit of Jupiter sending good vibes to both Moon and Sun from the sign Pisces. Pisces is compassionate, versatile and embraces change. Activate those traits in your self or receive those graces during this Full Moon! Truths tend to be illuminated by a Full Moon, and sometimes those are hard to accept, but this really does look like a Moon with silver linings! Jupiter will help us see how to make the most of circumstances and expand our choices and our perspectives. This Full Moon may instigate travel or big moves, and Taurus, Gemini and Sagittarius, you're positioned for that effect. Cancer and Capricorn, this Full Moon is pivotal in personal and relationship situations. It's a peak in the action, and using the Sagittarius/Jupiter attitude of open your mind and go for it could be very helpful. The Moon will move to Leo at 5:18 pm, just after the Moon is Full, and be opposite Mars in Aquarius tonight. A challenge to our ideals and in some cases a direct confrontation is to be expected. Mars brings out our frustrations. Try to deal with calm and reason. Leo, Scorpio, Aries and Aquarius are most likely to be involved. It's hard to run away during Full Moon time, so just face things head on and with honesty and integrity. Fortunately Leo and Aquarius are not overly emotional signs. Look for strengthened alliances if all goes well in discussions and debates. Wear gold. The Sun moves to Aquarius at 5:19 am, and the Moon is in Leo working with Venus in Sagittarius. All of this optimistic energy after the Full Moon is good! The Moon and Venus, planet of love, help create positive feelings between us and enjoyable times this week. Leo, Aries, Sagittarius (the fire signs) and Aquarius, Libra and Gemini are all favored by this action. Take steps to improve any difficult situation today. Otherwise if things are happy just enjoy. The Leo Moon encourages fun! Tonight, the Moon and Saturn help harness creative energy and the urge to organize and plan. Happy Birthday Aquarians on the cusp! Wear purple today. The Moon is in Leo until 6:10 pm and void of course from 1:58 pm until then. Get important business and conversation taken care of before 2 pm EST. It's a good morning to shop, improve your appearance, have a social business meeting, or even make a significant decision. Leo Moon also favors the arts and charities, so any work or event related is well timed. Leo is one of the zodiac's most giving and generous signs as well as the sign of luck, creativity, and children. The void of course hours are great for games and fun or working on a light schedule and mixing business with pleasure. It's a happy hour kind of day and we'll want to blow off any post Full Moon stress and hopefully let things go that have weighed on our shoulders. The Virgo Moon brings in the weekend in any easygoing way and it's good to have flexible plans or get back to unfinished tasks. Wear navy blue. The Moon is in Virgo for a practical, flexible Saturday that's mostly very agreeable. If there are issues to be worked out they're likely to be with significant others and relate to wanting more freedom and space via Venus in Sagittarius, a sign that refuses limits! Jupiter makes a big move into Aries affecting the long term and encouraging newness, travel, and broadening minds, an effect that will last for months. If the travel bug hits hard, that's Jupiter in Aries pushing us out of comfort zones and into the larger world! There will be much more about Jupiter in Aries in the forecast from here on, but Aries it's very beneficial for you! Gemini, it's a time to finally act on your wishes rather than always putting something else ahead of yourself. Sagittarius, it will be a great year for friendships, love and luck! A mix of tasks and fun is ideal today. Wear red. Oppositions in the signs Virgo, Pisces, Aries and Libra mean tough negotiations and strong chances of conflict. With Venus and Saturn lined up, love and relationship matters are in our midst. Fairness is very important, as is a logical approach. In the wake of a Full Moon last Wednesday and a series of winter eclipses, status changes and decisions are very likely now. Any sign can be involved, and while it's a good time to take action and move on things that have been pending (since there are no retrogrades in the way), do take decisions seriously and consider them permanent. The Moon is void of course from 3:06 pm to 5:59 pm so have important conversations before or after that. Those hours are also a no-no for major purchases but there are plenty of hours in the day. If you need to make excuses or have something brushed aside and forgotten, go for those void of course hours on the other hand! Today brings up differences for certain. Wear lavender. The Pisces Moon has it's last hurrah for a few void of course hours from 6:12 to 10:24 am. Expect people to be in slow motion early, though conjunctions between the Moon, Uranus and Jupiter may mean we have to react more quickly than we want to. At 10:24 the Moon moves to fiery Aries and works with Venus in Sagittarius, helping us initiate relationships or get beyond stuck points together. Take a new attitude with someone you care about today, especially if you're a Leo, Sagittarius, Libra or Aries. Mercury and Neptune align in Aquarius and Sagittarius for good collaborations and creative ideas. Tonight squares raise questions and pose challenges related to communication, surprising developments, and ability to organize. Try to react logically and positively even with impulsive Aries energy leading to potential overreactions. Aries and Capricorn, Pisces and Sagittarius host this activity but we can all be implicated and Gemini might feel this in relationships and home life while Scorpio may have friendship things and financial matters to work out. This is a very busy day in the zodiac! Today's color is red. The Moon's potentially harsh opposition to Saturn and Mercury's square to Jupiter indicate a challenging day. The square can lead to progress, and communication is key. Engage in talks and negotiations regarding opportunities but also personal relationships and emotional matters. Sagittarius and Pisces host that activity but it's relevant to any sign. The Moon and Saturn bring up legal, relationship and other serious matters that have likely been ongoing. Today could potentially lead to resolving things though it may not be easy for either party. It's unlikely that one person or party gets their own way today. It's a matter of negotiation and compromises that are not quick or easy to reach. There's a need for fairness, objectivity and maturity today. Tonight clear communication is especially important. Wear yellow. It's a first quarter Moon in Aries, a very big day for new endeavors, initiations, and activating plans. Movement is the idea! Remove road blocks and get past stuck points. Mars in Sagittarius works with Uranus in Pisces inspiring us to explore, go places, and rebel against the usual. The Moon squares the Sun and Mars in Capricorn, and that often means power plays, debates about who's in charge of decision making, and also a need to restructure and find order. Alpha dogs, matriarchs, patriarchs and all the other dominant forces will show their faces or bare their teeth. With Mars so active in the zodiac, today has an aggressive streak. Tonight the Moon and Mercury align helping with needed communication and encouraging planning. The Moon is void of course only from 9:47 to 10:37 pm and then shifts to Taurus. The urge to ground, settle down, and calm storms is in the forecast later tonight. Wear orange. The Moon is in Taurus and Mercury moves into Capricorn, also an earth sign. Earth signs encourage practicality, productivity, and down to earth approaches. If emotions have been running high and competition strong, today we get a chance to mellow out a bit, set goals or work effectively toward them, and talk about problems in a more rational manner. The Moon forms a trine to Pluto in Capricorn and we may want to act on things we can control and put things aside that we can't really deal with. Secrets or hidden agendas might be obstacles. Attempts at removing them are worthwhile today. The five senses are ruled by the sign Taurus and trusting what we see and hear might be easier. Go for the tangible, solid and real over pipe dreams or questionable leads. Tonight, Mars aligns with Jupiter which is positive for altruistic efforts, situations where compassion or help is needed, and an active approach to sensitive situations. There's a good blend of practical and creative influences at work. It's a good night to ask for help or aim for workable solutions. Wear green. The Moon is in steady Taurus. Mars and Jupiter action continues through today inspiring change and an active approach. Long term decisions are favored. Show perseverance and commitment for what you hope to attain. Scorpio, show that you are loyal and true. Aquarius, show that you re worthy and capable. Leo, romance is in the air and could come by surprise! Taurus, you're in your element personally, but be wary of mixing financial matters with friendship this week. Today, doing productive, grounding things will feel good whether that's repairing, building, cooking, or otherwise creating. Travel will be appealing especially for Aries and Cancer. Tonight the Moon and the Capricorn Sun are in harmony for either work or socializing, and the earth signs including Virgo are especially favored. Be confident tonight. Wear brown. The Moon is in Taurus in harmony with Jupiter and Mars at daybreak, setting up an optimistic attitude. Aim to accomplish something you'll feel good about. The Moon is void of course from 7:47 until 8:23 am and then moves to Gemini. There are no planetary alignments with the Gemini Moon, giving us space to think and plan. Get rid of clutter in the mind or in your home or workspace today. Mars moves into Aquarius at 5:42 pm rebelling against the usual and inspiring originality. This is also a stubborn place for the warrior to spend time, so major attitude is in the air for weeks to come and may be most evident in Aquarius, Scorpio, and Aries. This can come across as arrogance or a fiercely independent attitude. Tonight is social and flirtatious. Wear light blue. The Gemini Moon is opposite Venus in Sagittarius. Relationships are likely to be flirtatious and changeable. It's a good day to meet people, yet it could be a difficult day to deal with long term relationships. Today is also indecisive and fickle. The Moon works with Saturn in Libra, helping us harness mental energy and a bit of self discipline. Put your mind to a problem or conversation that needs to be had. Aim to work things out and solve problems, but the energy is concentrated in mutable signs so keep some flexibility or multiple alternatives. Wear yellow today. At 4:03 am Capricorn hosted a Solar Eclipse along with the New Moon. New Moons are times of initiation and forward motion. When a solar eclipse accompanies the New Moon, changes are often unanticipated and fast! Capricorn's ambitious nature will be evident! Shifts from this eclipse, since a solar eclipse is paternal or masculine, include male figures in our lives making significant moves and changes. Leos, ruled by the Sun, join Cancer and Capricorn as signs highlighted by the eclipse. Expect administrative and structural changes and news on an international as well as corporate level. Note that eclipse's action unfolds over a period of weeks, so the next Full Moon and New Moon will again vibrate with after effects. Capricorn will undergo very personal changes. A brand new way of presenting ones self and a fresh perspective on life and relationships are two distinct possibilities. Others may be surprised by changes Capricorn undergoes this season. Aquarius is most likely to experience shifts in mindset. Inspiration is one form this may take. Dreams and inner processes are strongly activated, and Aquarius may want down time to make sense of events during this period. Pisces may meet new friends or business contacts now. Unusual circumstances may lead to good fortune and strong connections with people. A wish may be realized. Aries may suddenly be in a position of prestige or authority. This is a career eclipse for Rams. Appearance and displays of talent and ability are important precursors. Taurus experiences this eclipse with an eye toward the future and opportunities that include travel, studies and spiritual or intellectual pursuits. Gemini will find financial partnerships and matters must be prioritized. On a personal level, Gemini may become involved in affairs or clandestine activities and find that privacy is important. Compromise regarding financial, business or personal affairs becomes more likely. Cancer is in the midst of this winter's eclipse activity and may find many levels of change occurring simultaneously. Relationships are most likely to be impacted and shift as a result of this particular eclipse. Status changes will be common for Cancer. Leo, ruled by the Sun, is in a position to make positive changes in health, routine, and work in the weeks ahead. Changes in the workplace including departures or arrivals among colleagues and also new opportunities will be common for Leo. Virgo's earth energies are in line with the Capricorn eclipse. New friends or lovers may appear. A change in luck is another potential effect. Libra experiences the Capricorn eclipse through changes at home and with family. It may be a time of moving, repairing a relationship, or renovating the house. Changes are likely to be necessary right away rather than with time to plan. Some Libras may find home and career in a tug 'o war now. Scorpio has the added effect of a very active planet Venus. Relationship matters are highlighted and so is communication. A sudden need to express, write about, or discuss very important matters is in the air. Venus is love, partnership and forgiveness. The eclipse indicates significant interactions and news that impact far beyond today. Sagittarius could receive a windfall or suddenly need new employment as the eclipse stirs money matters. Financial challenges and opportunities are both within the range of this eclipse. New work, changes in the workplace, access to additional resources and/or unepxected expenses are all possibilities. The Moon enters ambitious Capricorn at 2:39 am and meets Pluto after noon time. It's a serious business day. This may involve personal business or work/studies or any combination of that! If you're making New Year's resolutions or trying to make any changes it's a better time to make progress now that Mercury retrograde is done. On this day before the New Moon rethinking and getting reorganized is a good idea. Tomorrow a solar eclipse will push forth any number of changes and continue an eventful period of time that began with a lunar eclipse two weeks ago. This one also impacts Cancer and Capricorn most though any of us could be strongly affected. Generally we can't prepare much for the events eclipses precipitate, however it's not a bad idea to get your head together or set a course of action now. Pluto tends to bring up things we've buried deep down. Deal with some of that if the time seems right. The New Moon will arrive overnight. Wear green. The solar eclipse in Capricorn at 4:03 am EST sparks significant shifts and the Moon also meets fiery Mars today. The zodiac is full of activity and it appears anything goes and maybe not predictably! If you need a fresh start the New Moon/eclipse can be a very good thing. Things may have to be torn down before they can be built up again. Venus aspects three planets today indicating relationship status changes and updates. Cancer and Capricorn, the eclipse and Venus activity hit hot spots in your chart and new people may come into your lives along with personal changes you are likely to experience now! Life should feel interesting at least! Leo and Aquarius, you may be inspired about work, need a little bit of down time socially, adopt new routines, and find your dreams activated. Scorpio, communicating your thoughts or ideas is very important this week. You want impressions to be favorable. Taurus, that goes for you too and it may be a good time to plan travels or new learning. The Moon's meeting with Mars tonight can be confrontational. But it may just be motivating, so harness that energy! Wear white. The Moon starts void of course from 7:15 am to 11:08 am. Wait on big decisions or announcements until after 11:08 am. Expect there will be news as a result of yesterday's New Moon and solar eclipse! Administrative, organizational, and technical changes could be the result of a Capricorn eclipse. Solar eclipses tend to be about the males in our lives and also the sign Leo. This one was in Capricorn and Cancer gets equal treatment. News and developments will continue for weeks, but when the Aquarius Moon kicks in at 11:08, it's a great time for planning, for being more committed, and for joining groups that center around a common focus. The later part of the day is good for collaborating and team building. Wear turquoise blue. The Aquarius Moon is in harmony with Saturn in Libra. It's a good day to act wisely, get advice and making changes you've been planning for. Aquarius is a fixed sign but is not traditional generally. Overthrowing the usual and breaking the norm is in the forecast. With Saturn involved it's best to move thoughtfully though. Avoid being impulsive but do make important moves. Today's color is blue. The Moon is in Aquarius until tonight. Aquarius is a sign of vision, and the Sun and Saturn square indicating a need for discipline and justice today. Take things seriously and make well thought out and researched decisions. Venus moves out of Scorpio after a long stay. Venus in Sagittarius has an independent spirit in love and relationships and is favorable particularly for Sagittarius, Leo, Gemini and Aquarius in the weeks coming up. It's a good time to let go of a grudge or obsession and move on! Scientific, legal and creative matters are all favored today, but do act with clear judgment. The Moon is void of course from 3:51 pm until 9:57 pm then in Pisces. Relationships may feel strain or stress tonight with Venus square to the Moon. Wear pink. The Moon is in Pisces in harmony with stealthy Pluto in Capricorn. The sensitivity meter is running high. Be mindful that people could feel easily slighted or overlooked. Taking creative energy and doing something productive with it is favored! Build, sculpt, or even paint the walls! Pisces is an expressive sign, but the urge to keep secrets is strong today. Follow your intuition. Arts events are well timed. Today's color is green. The Pisces Moon and Capricorn Sun work together today. Like yesterday we can harness creative energy with tangible results. Blending the feeling and the practical is in the forecast. Sagittarius and Aquarius you may find your creative work profitable and might look for marketing opportunities. Capricorn, focus on communication and that may include building a resume, establishing contacts, or writing for research or personal reasons. Aquarius, some down time could be very restorative. Don't overbook yourself. When the Moon is in Pisces we tend to take our time and stop and smell the roses. Today the pace is a little bit stronger than that so set out to accomplish a simple goal or two. Wear light blue.